80 ideas from a year-old church with 1000+ members. Olu Brown and his Impact Lead Team are building a church in the fast track and provide encouragement for you to do the same in your context. Zero to 80 is a quick, timely read for church leaders seeking new strategies for innovative and more effective ministry. Hailed by many as the new church start in the U.S. to watch, Impact Church in Atlanta had over 1,000 people participating in worship and more than 400 people in small groups a year after it launched. 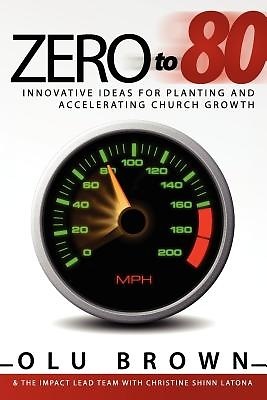 Zero to 80 provides eighty practical ideas from their wild ride in the areas of vision & design, relationship building, marketing, small groups, hospitality, worship, logistics, human resource development and effectiveness for the long haul. Apply these ideas to create and accelerate momentum for your new church start or growth of an existing ministry.